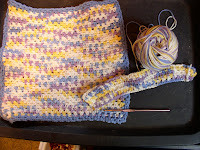 Lorrie knits and sews: Shawls and socks and more. Knitting progress was slowed considerably by a black shawl. The yarn is Aussi Sock. I still need to write the pattern. It's on the to-do list for today. 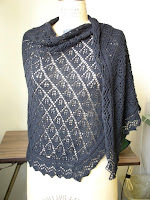 I delivered the shawl to the yarn company last week at the TNNA industry show. I saw lots of people and made some new contacts for design. I have to be careful about over committing. I still have a sewing business to run. I did pick up a book at the show. New Twists on Twined Knitting by Laura Farson. I've taken a class on twined knitting. This book uses the technique with two colors. There are hats, mittens and scarves. Since the technique makes a double weight fabric, there are many things it's not appropriate for. It's a Martingale publication. Now that the shawl is done, I can spend time with a pair of socks that were started in early May for a May 19 birthday. 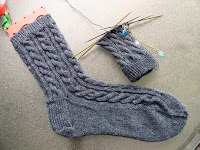 I'm at the heel on the second sock. The pattern is from a vintage book, knit as written except for the 10 1/2" leg. Yarn is Trekking. I've also been crocheting dishcloths since before Easter. One is now finished. These will be Christmas gifts. Lighting is bad in this photo. I've been doing a little sewing for my self, but have nothing to show yet. I'm trying to work on it for 1/2 hour a day. I'm making a blouse and will retire a number of older things. I'm trying to relax today. Next Sunday, I'm teaching knitting all day.